There are many New and old WhatsApp Tricks and Tips like How to Send GIF’s in WhatsApp, How to Hide Blue Tick in WhatsApp, How to Send One Message to Everyone, How to Send PDF Files in WhatsApp and much more. WhatsApp Messenger is one of the most popular apps across all mobile platforms, handling over 30 million messages every day – and now with end-to-end encryption. There are some awesome features of WhatsApp that you should know. There are many Tips and Tricks of WhatsApp or you can say Hidden or Secret Features of WhatsApp. So, let us discuss some Tips and Tricks of WhatsApp 2017. WhatsApp has added the WhatsApp Free Audio Calling Feature Back in 2015 and now a few months back they have introduced the WhatsApp Free Video Calling Feature for both Android and iOS. Now you don’t need to download any other third party app for Video Calling Like Skype, IMO, OoVoo etc. 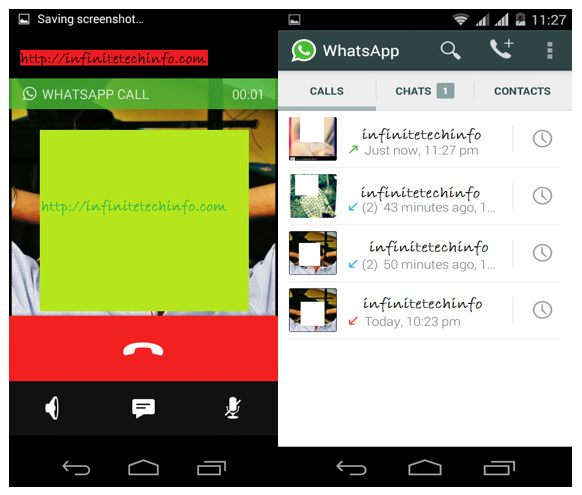 Here is the Simple Video Tutorial that how you can do WhatsApp free Video Calling. Sometimes you don’t want that everybody should come to know about your last seen and the ones whom you don’t know but they have your WhatsApp Number should not be able to see your profile picture and status as this is something against Privacy. So WhatsApp has provided the settings in which you can hide your last seen, Profile Picture and Status. To Hide Your last seen go to Settings > Account > Privacy. There you will have the options to choose whether you want your last seen, profile picture and status to be seen by “Everyone”, “Contacts” or “Nobody”. Blue Ticks in WhatsApp is something that I really don’t like at all. Because sometimes you are busy and you open the unread messages and might not be able to reply to all messages instantly but the other person (message sender) can see the blue ticks which means that you have read his/her messages and this thing has created many issues in Relationship especially in between lovers. So, to get rid out of these blue ticks, WhatsApp has introduced new settings in which you can turn off Read Receipts or Blue Ticks in your WhatsApp Account easily. To Turn off WhatsApp Blue Ticks go to Settings > Account >Privacy. In the Privacy page, you will find a toggle to turn off “Read Receipts“. Note: If you turn off read receipts, you too will not be able to view anyone else’s read receipts or Blue Ticks. Sometimes it is handy that if you are doing some work like playing games, watching videos. reading an ebook and someone texts you and at that time you have to close your current window and open WhatsApp in order to read the message or reply. So, if you enable Popup Notification then you can read the messages and reply to them from your current screen/window. WhatsApp has now increased the number of members in the group to 256. But on the same time when you send a message to any group and you are not able to see who has read this message so in order to check that who has read your message just simply tap on the message and tap “Info“. Once you do that, you will be able to see the time when your message was delivered and read. There are some groups in which you were forcefully added by your friend and if you left that group your friend might not feel good so in order to avoid this just simply mute the group and then let them do whatsoever they have to or there are some groups in which some people always keeps posting and most of the times you feel irritated because of that notification sound again and again. So to avoid this just tap on Mute and then Mute the notifications for 1 year etc and the same you can do with individual chats also. Many of us have 2-3 WhatsApp Accounts as 1 for Personal and the another one for Work or Business but for this, we need to have 2 Mobiles because we can use one account on one phone only. So for this, you can install third party app dubbed Parallel Space on Android that lets you use two WhatsApp accounts on a single device. After you have installed Parallel Space, you can just use the Clone apps feature to run two instances of WhatsApp. So. these were some cool features of WhatsApp that you should know. We will add more soon. So bookmark this url for the updates. For Latest WhatsApp Tricks Stay Connected with us. I Hope you have liked these 10 features if you have any doubt or query kindly drop your questions/comments in the comment section below. Your feedback and comments are always welcomed. Hello Sumesh, your blog is very interesting. I downloaded Whatsapp but I uninstalled it because I was worried. I don’t know how to use it. I sticked to Viber instead. However, I was very thankful, I saw your blog. I can not reinstall Whatapp. You can again install the WhatApp from PlayStore or get the WhatsApp Apk from WhatsApp official site. Very informative post and all above mentioned interesting and hidden whatsapp features really helpful actually to become the master of this amazing app….!! This is very interesting and useful tips. Great information thanks for sharing this article Very informative post and all above mentioned interesting and hidden whatsapp features really helpful actually to become the master of this amazing app….!! Awesome WhatsApp trick. This is relay helpful. Keep it continue. The method of using one more WhatsApp Accounts in a device is the best and super helpful form me. But I need to know a WhatsApp hacking tricks. I need to keep eye on the younger brothers chat history. Because he is probably abusing the WhatsApp facilities. I need to track him to scare him. He is only 13years old. If he does anything abuse on WhatsApp, it will destroy his future. I have already downloaded a hacking application for hack WhatsApp messenger. But I think, you are a WhatsApp expert. Can you give me some suggestions for how to track my younger brothers WhatsApp in hiddenly? these tricks will really enhance our WhatsApp use otherwise it is boring.